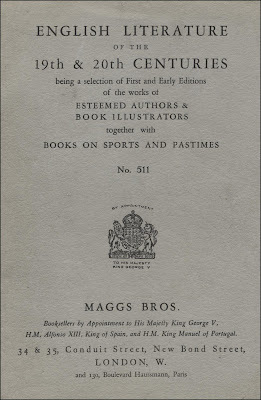 The catalogue of English Literature of the 19th & 20th Centuries...together with Books on Sports and Pastimes, issued by Maggs Bros. in 1928, contained 428 pages listing 2,526 items. There are only three chess books but each is a rarity. 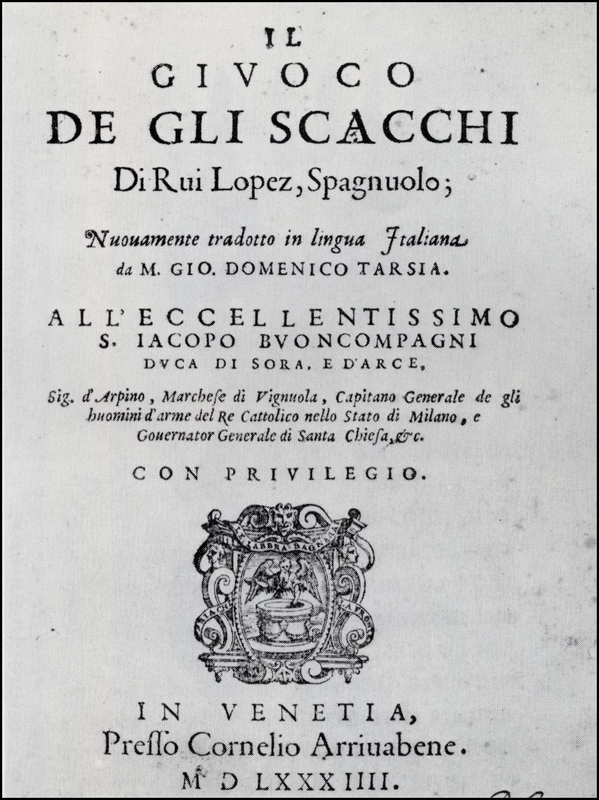 This is the very rare English translation of Damiano's Questo Libro e da Imparare Giocare a Scachi first published in Rome in 1512. 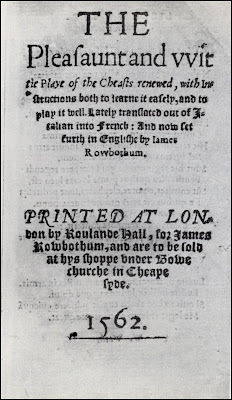 This Italian work was translated into French by Claude Gruget and published in Paris in 1560 with the title Le Plaisant Jeu des Eschecz, and Rowbothum's book was taken from the French translation. 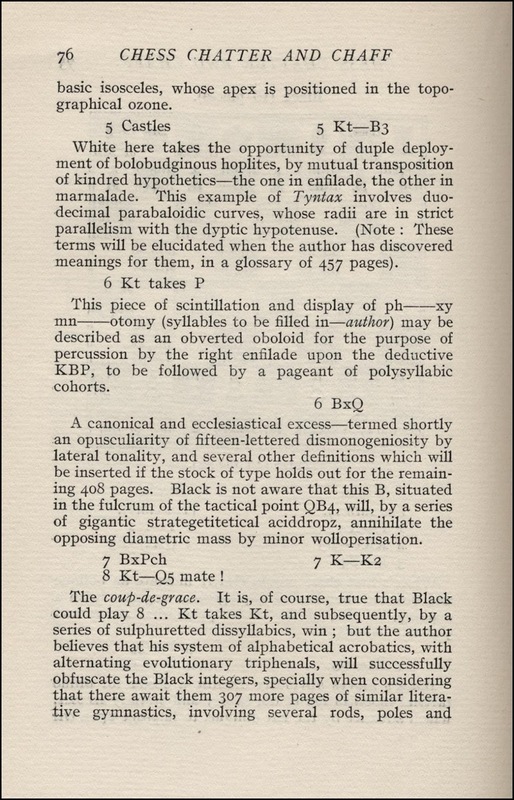 The following page from Rowbothum's book shows the clumsy notation in use at the time. Richard Eales claims in his Chess: The History of a Game that, although Rowbothum was usually thought to have been the translator, it was more likely William Ward, who wrote the prefatory verses. 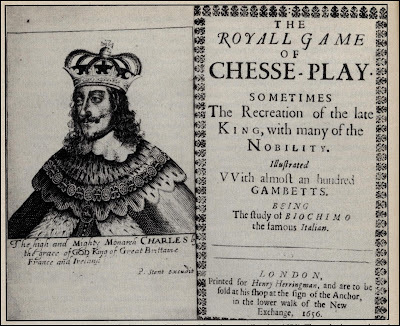 However, Chess Texts 1562:1 by Whyld and Ravilious, state that the translation is believed to be by Ralph Lever the author of a book on the philosopher's game. J. 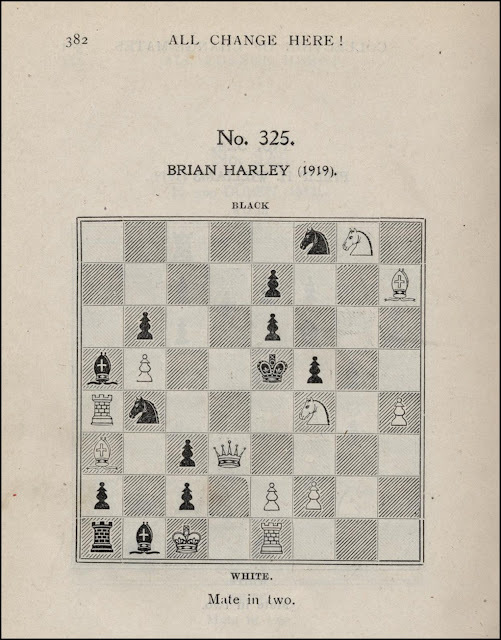 A. Leon gave a detailed description of this work in The British Chess Magazine for November 1894 on pages 434-437. This was the first publication in book form of Gioachino Greco's games which had previously only been available in manuscripts. 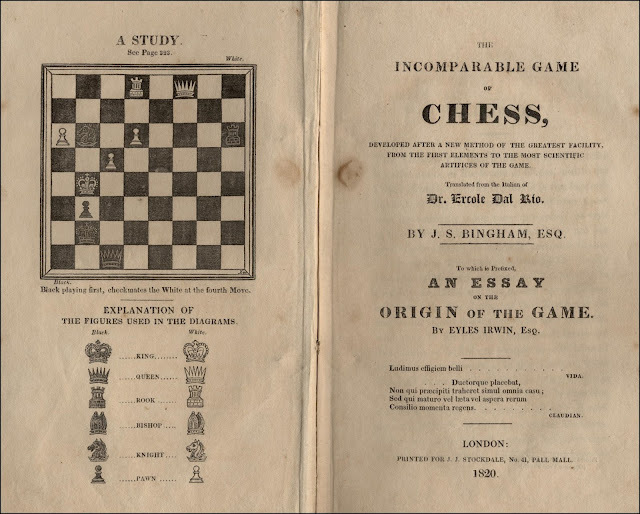 Francis Beale was the editor and, Richard Eales, in his aforementioned History, states that Beale augmented Greco's games, which were given as in the manuscripts with almost no notes or explanations, by adding a much more elementary introduction taken largely from The Famous Game of Chesse-play by Saul/Barbier; an edition of this work had "recently" been published in 1652. The inclusion of a portrait of King Charles I as a frontispiece was a strong political statement by the royalist supporters involved with the production of the book. King Charles I had been executed in 1649, following which the English monarchy was abolished, and a Commonwealth of England was declared with Oliver Cromwell as Lord Protector. The monarchy was restored by Charles II in 1660. Many copies of this book had the portrait removed for fear of reprisals. 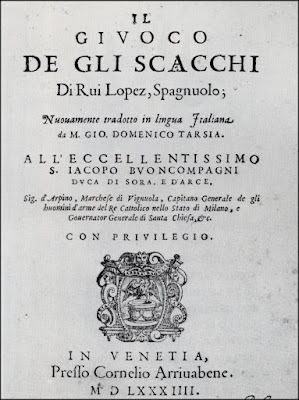 This is Giovanni Domenico Tarsia's Italian translation (albeit inaccurate according to Richared Eales), of Ruy Lopez's Spanish work first published in Alcala in 1561, Libro de la invencion liberal y arte del juego del Axedrez. The variant spellings of Gombito and Gobito on page 133 of this work are of bibliographical interest. Interestingly, this book was published by James Rowbothum who also wrote the dedication to Robert Dudley, Earl of Leicester, in 37 4-line stanzas. 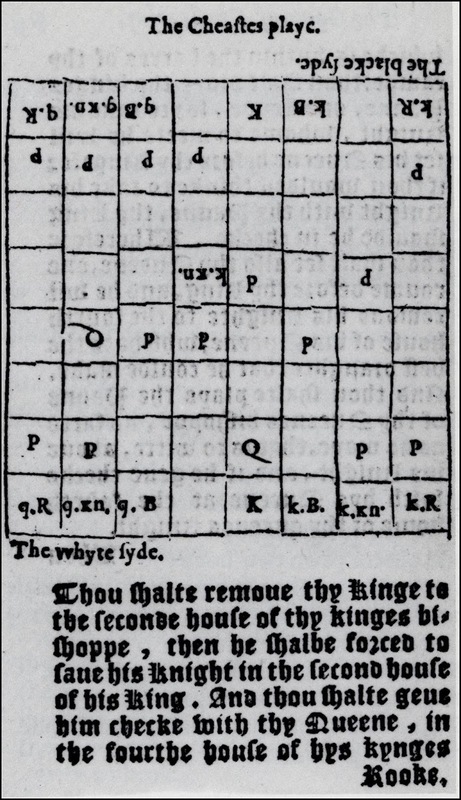 While not related to chess, the philosopher's game or rithmomachy was an arithmetical game played on a double chess board. "Last week I bought part of the general library of the late Senor José Brunet y Bellet, of Barcelona. A Fine Collection... 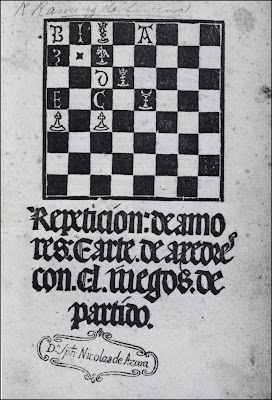 It includes one of the great chess prizes, a copy of Lucena, also a few other chess works of less importance - the Portuguese Damiano, etc. The Lucena is not a perfect copy, four pages being copied by hand from the British Museum. Otherwise, it is in beautiful condition. 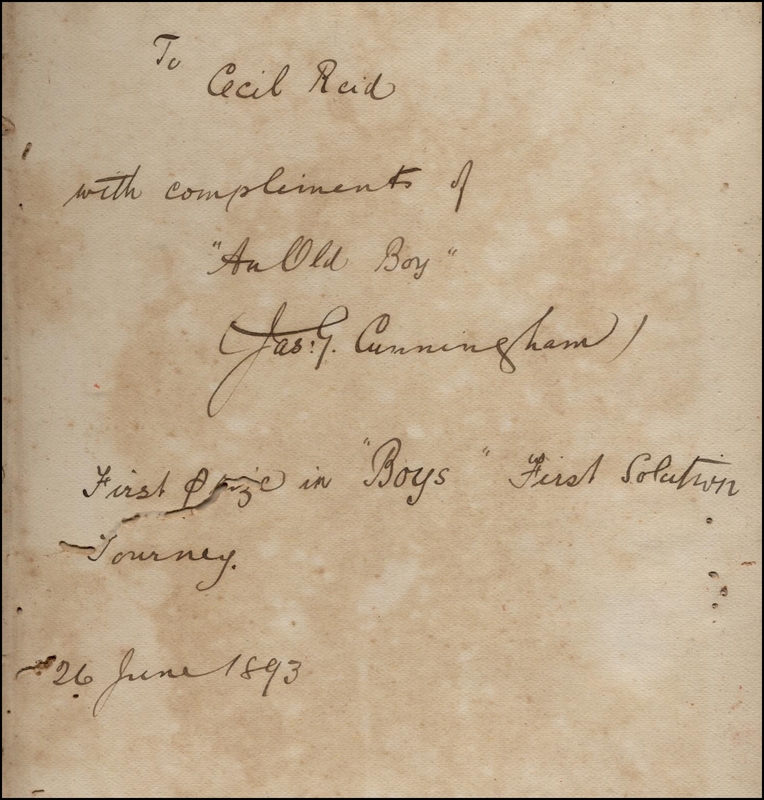 It bears the bookplate of James Whatman, evidently an Englishman. Have you any idea who this is? No, I am not related to Mr. White of Cleveland, though I have had some correspondence with him. 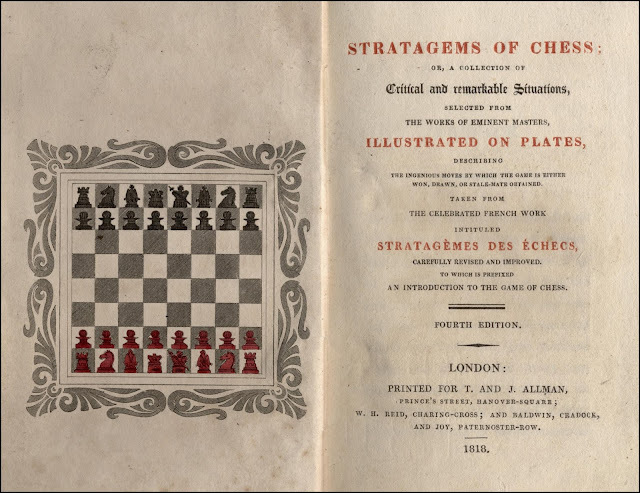 His great chess library...as he makes no use of it, its existence is, for the present at least, mainly interesting as one of the wonders of the World!" 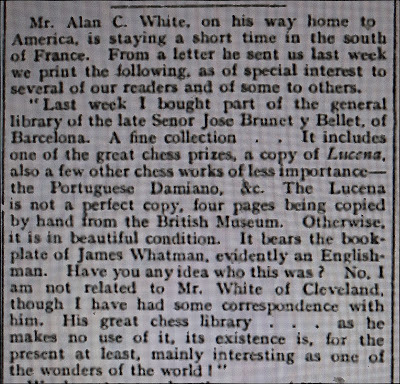 "As to the great chess library of Mr. White, of Cleveland - it has probably been of more service than Mr. A. C. W. realises, but in a quiet way, giving occasional information to the seekers after knowledge of the past of chess. Several of Mr. White's rare books and MSS. have been lent for study in England. But of course there are many others in Europe." 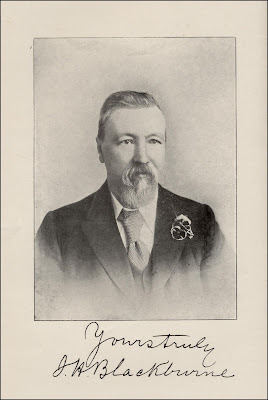 A.C.W., New York - Mr. Whatman was a gentleman of Kent. Two books in the British Museum Library have his book plate. They - the plates - are of a style not earlier than 1800. 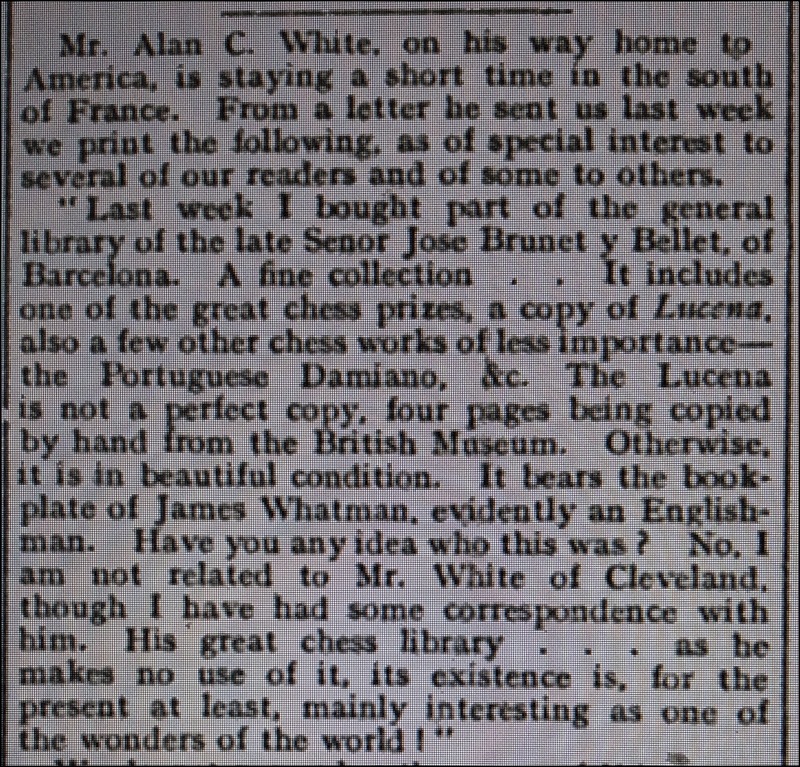 Jeremy Gaige, in his Chess Personalia, records that José Brunet y Bellet was born in Barcelona in 1819 and died there in 1905. LN 233 El ajedrez. Investigaciones sobre su origen. Barcelona, 1890 or 1891. LN 4253 De les costumes, dels homens e dels oficis dels nobles, sobre Joch dels Escachs, Barcelona, 1900. J. Brunet y Bellet's reprint. 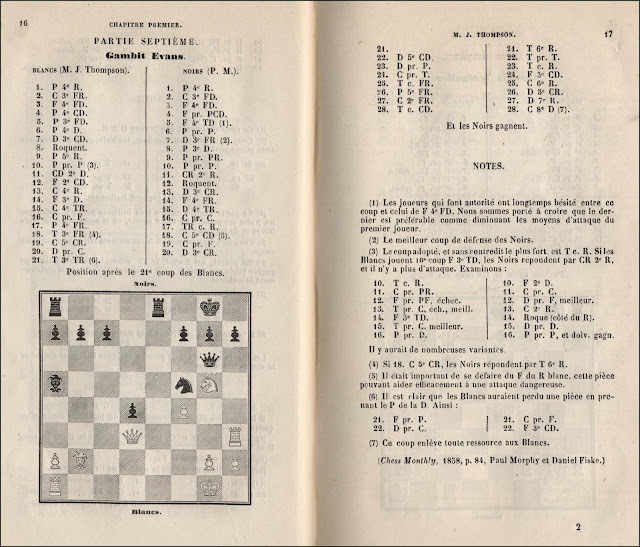 LN 4704 Lo joch de naibs, naips ó cartas, Barcelona, 1886. pp.24-32 on chess. 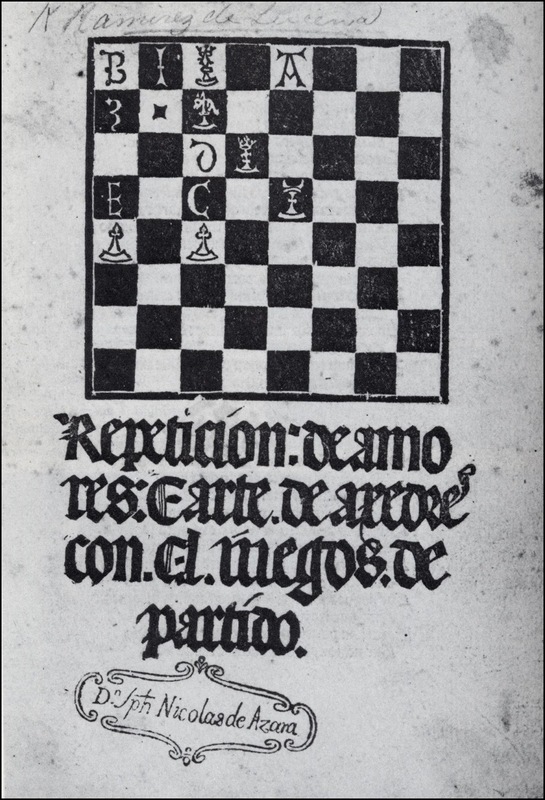 Luis de Lucena's book, Repetición de Amores e Arte de Axedres con cl iuegos de partido, published in Salamanca circa 1497, is indeed one of the great chess prizes. H. J. R. Murray states that "it is a book of considerable rarity", on page 784 of A History of Chess and notes that copies are known to exist in the libraries of The British Museum, Brussels, Madrid, Escorial, Siena and Rio de Janeiros, and also in the private collections of J. G. White (Cleveland), Mr. J. Rimington Wilson (Broomhead Hall, Sheffield), A. C. White (New York) and E. B. Cook (Hoboken). 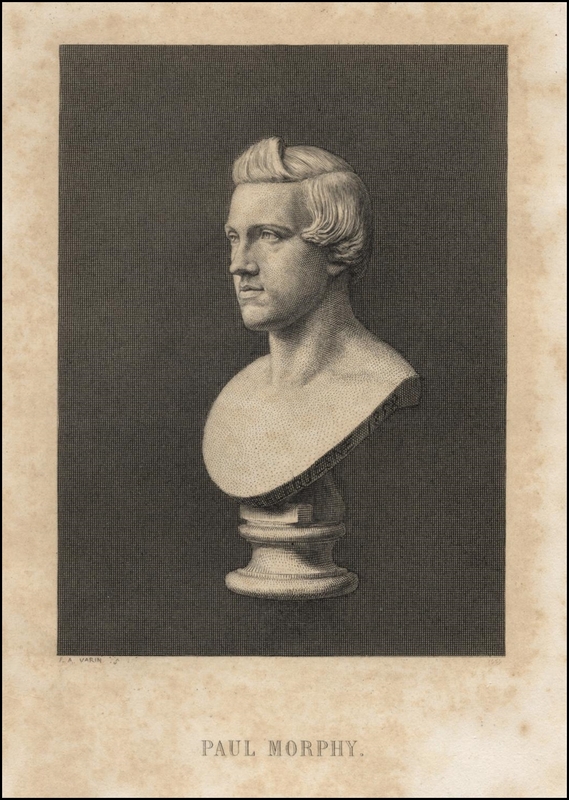 The Rimington Wilson copy sold for £550 at Sotheby's in 1928, an enormous sum in those days. As a comparison, copies of Damiano's book were priced at just a few guineas (maximum 14 gns) in Bernard Quaritch's catalogue No. 428 of 1929. 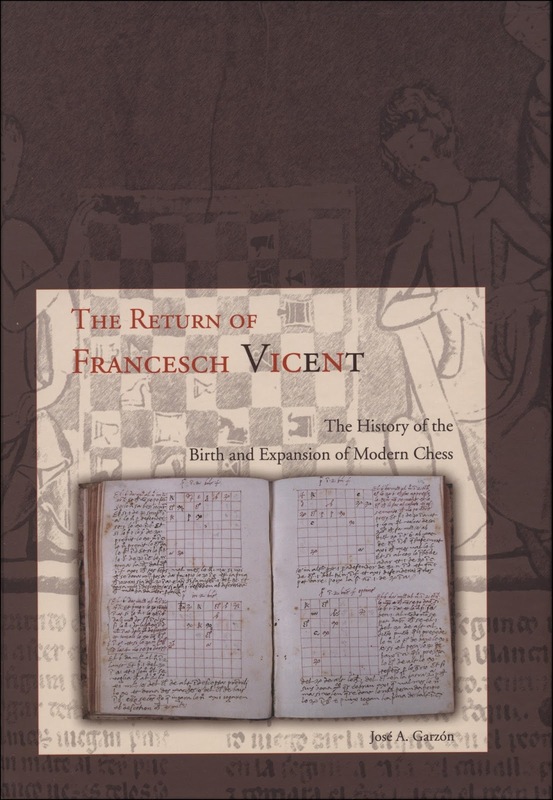 Substantial information about Lucena and his works can be found in The Return of Francesch Vicent, The History of the Birth and Expansion of Modern Chess by José A. Garzón, Valencia 2005. The Problem Art, A Treatise on How to Solve and How to Compose Chess Problems by T. B. and F. F. Rowland, second edition, New Barnet and Kingstown 1897. The first edition was published in Dublin in 1887 and this is an expanded version of that work. The authors state in the Preface; "up to the year 1886, there was no known work on the Art of Solving, whilst those on Composing were few." 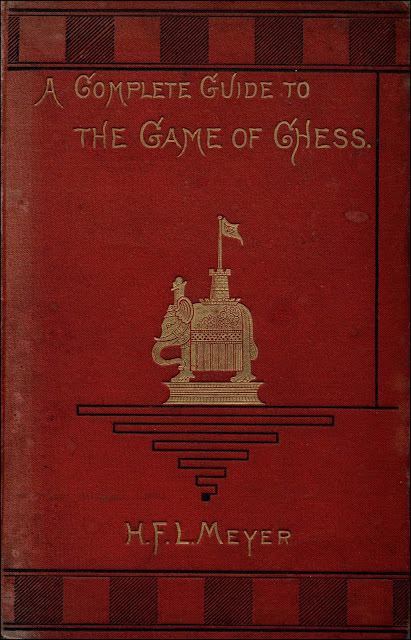 However, A Complete Guide to the Game of Chess by H. F. L. Meyer, published in 1882, has a short section entitled The Solving of Problems. 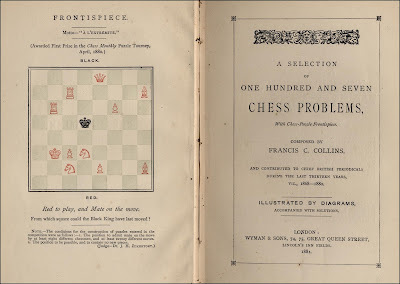 The main work, in English, on the art of composition before 1887 was Samuel Loyd's very scarce Chess Strategy: a treatise on the art of problem composition, Elizabeth (N. J.) 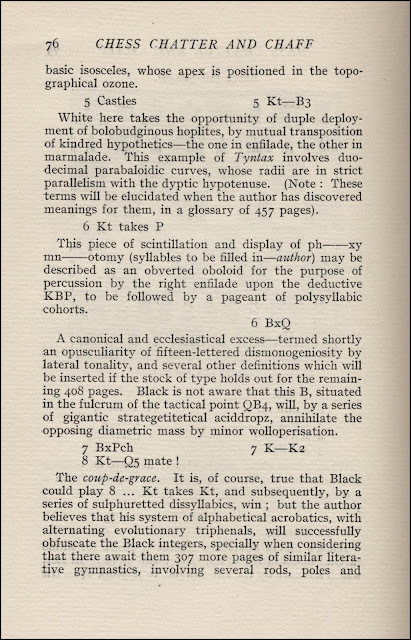 1878, while Meyer's book also has another short section on Methods of Composition. 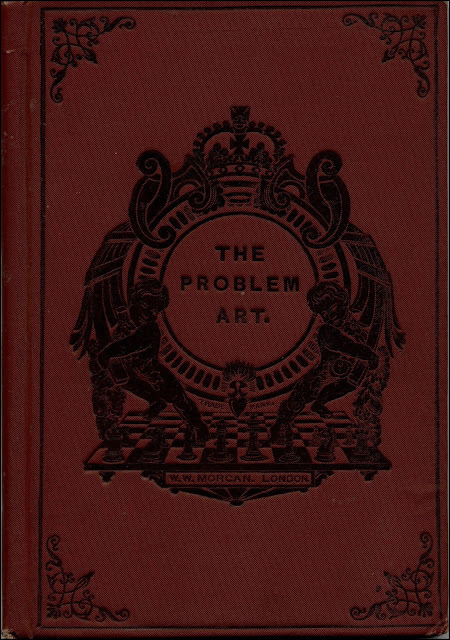 The Problem Art is an instructional work on problem composing and solving with around fifty problems sprinkled throughout the text to illustrate various matters. 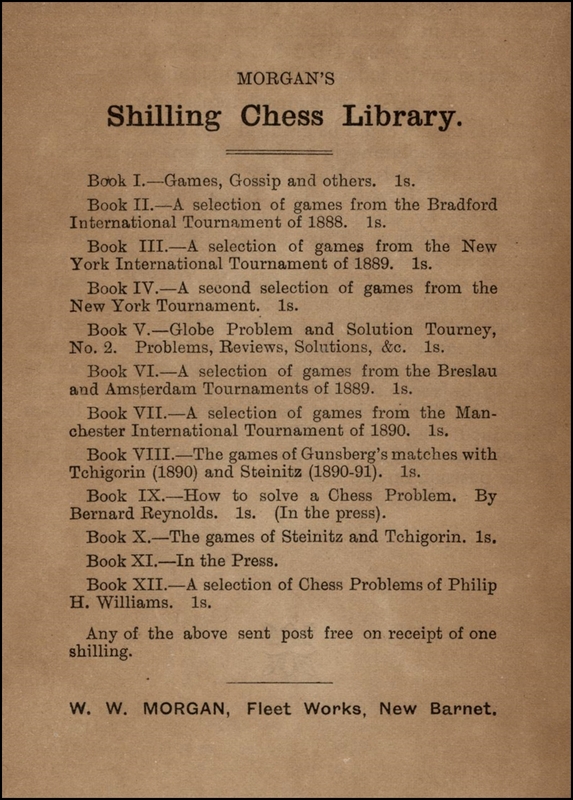 W. W. Morgan published the second edition and at the back is an advert for the series of pamphlets in Morgan's Shilling Chess Library. This lists the first twelve of the series, a thirteenth was published in 1901 - A Selection of Games from...Monte Carlo, 1901. Book XI in this series was titled Blindfold Play. All of these pamphlets were very cheaply produced and quickly became quite fragile. Consequently few have survived and original copies are scarce and difficult to find today. 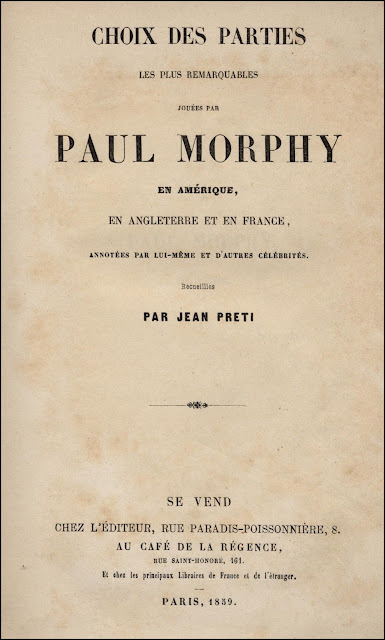 Choix des Parties, les plus remarquables jouées par Paul Morphy, by Jean Preti, Paris 1859. 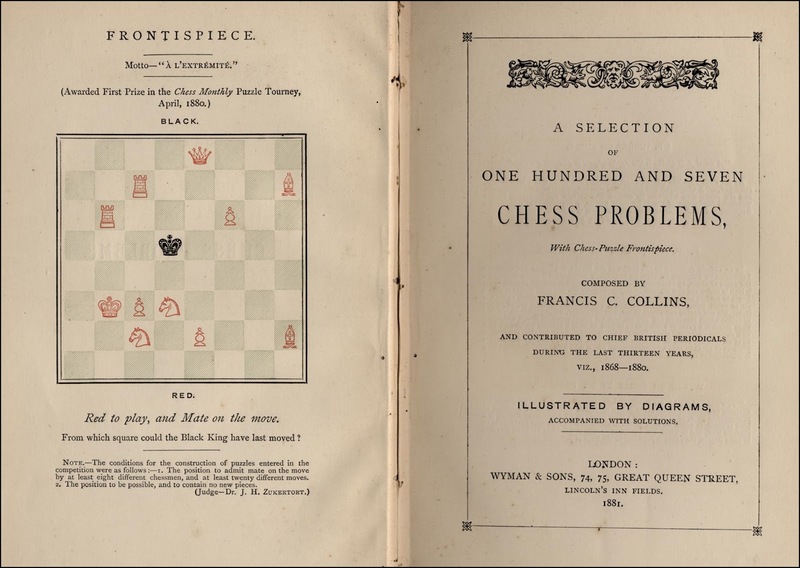 This was one of a number of collections of Morphy's games published in 1859, shortly after his triumphant visit to Europe; others were by Dufresne, Frere, Lange, and Stanley. Frederick Edge's book on Morphy and D. W. Fiske's Book of the First American Chess Congress were also published in 1859. 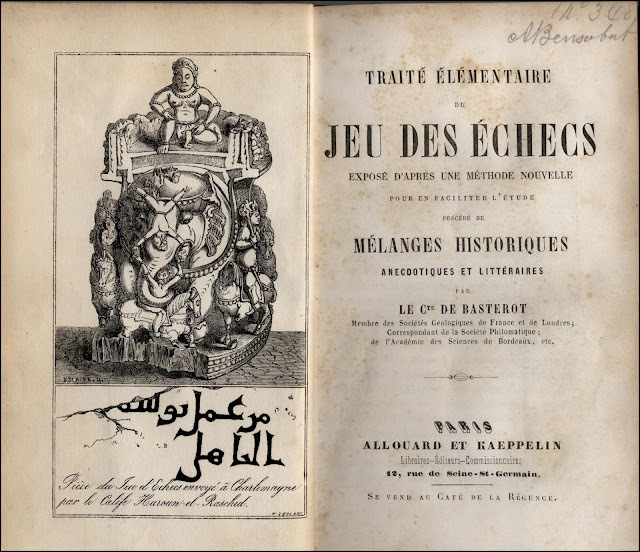 However, the first collection of Morphy's games was a 12 page pamphlet by Juiste Opgaaf: van twee merkwaardige partijen gespeeld door Morphy, benevens bizonderheden uit zijn leven published in 's-Gravenhage in 1858. This translates as Two remarkable games played by Morphy, in addition to particulars of his life, published in The Hague in 1858. 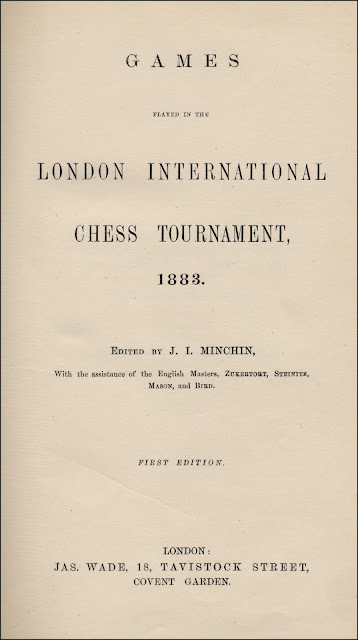 The periodical Chess Monthly, edited by Fiske and Morphy, also included some of Morphy's games in 1858. 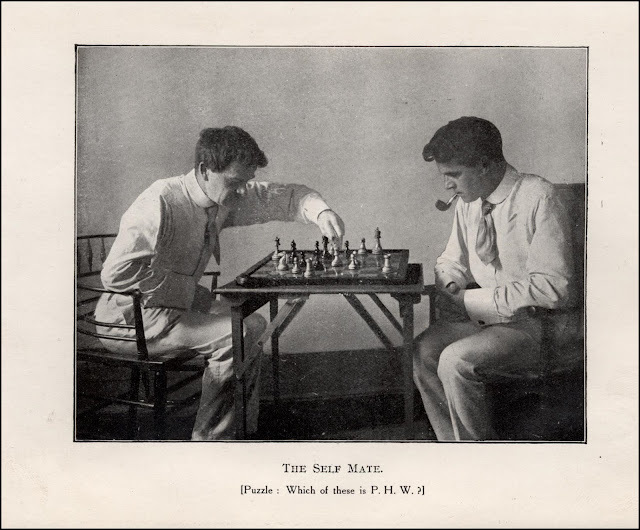 The Preface in Choix des Parties was written by Pierre Saint-Amant and outlines Morphy's life and chess career. The Liste des Souscripteurs has 171 entries and includes Alexandre, J. Arnous de Riviere, F. Edge, D. Harrwitz, I. Kolisch and Saint-Amant. Gillet, the propriétaire du Café de la Régence, took 12 copies. I think that Edge and Thompson were the only two English subscribers. 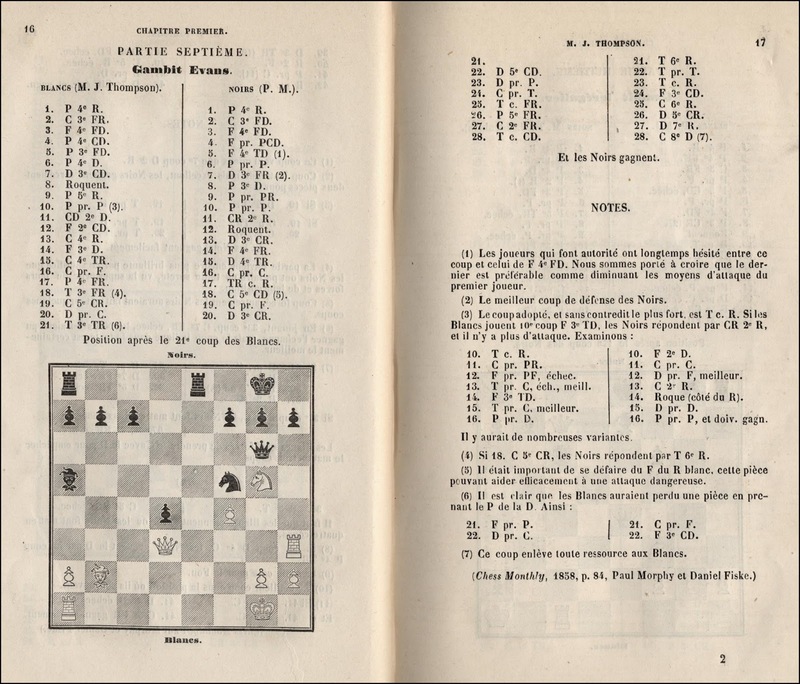 The book includes 107 games arranged in four chapters for games played in America, England, France and games played after departing Paris. 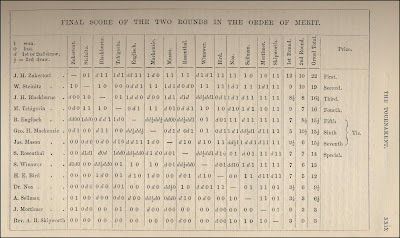 Notes to the games were taken from various sources, usually noted at the end of each game, including some of Morphy's own remarks, taken from Chess Monthly. 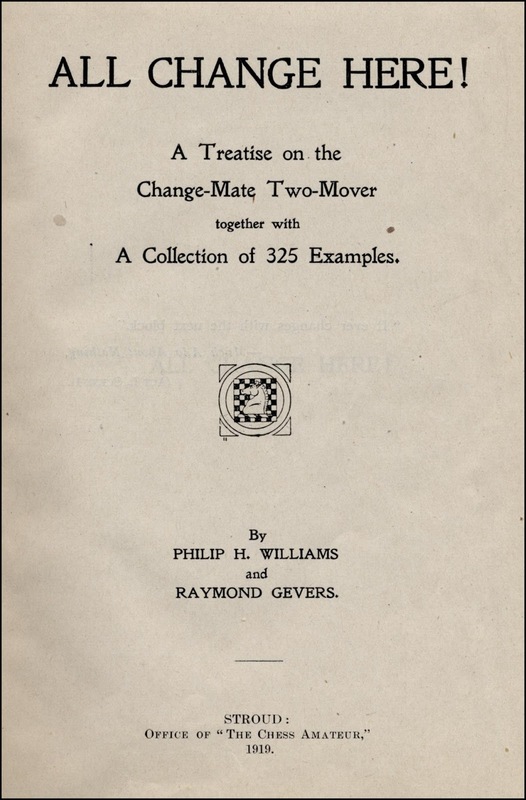 All Change Here!, A Treatise on the Change-Mate Two-Mover together with A Collection of 325 Examples, by Philip H. Williams and Raymond Gevers, Stroud 1919. 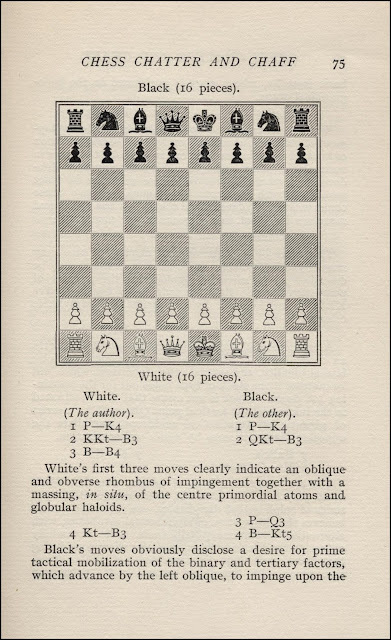 This is one of the few chess titles to include an explanation mark! This book was produced very much in the style of Alain C. White's Christmas Series, and, indeed, Philip Williams acknowledges A. C. White's interest and assistance in the project, and dedicates the book to him. 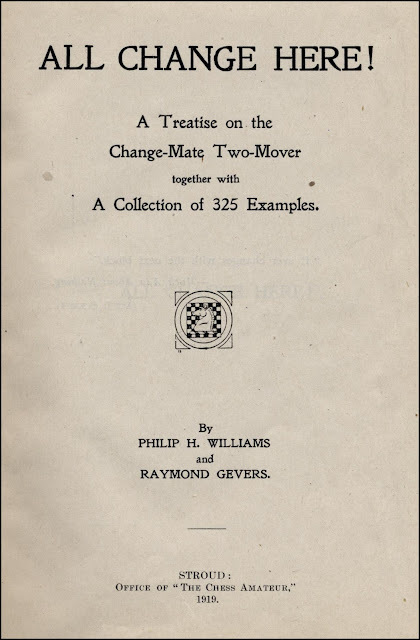 This is a collection of 325 two-mover change-mate problems by 105 different composers. The idea is that black is in zugswang, so white makes a key waiting move and mates after any black reply. 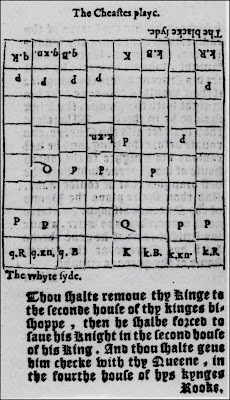 Each position is also a mate in one for white if black moved first. Williams succinctly described this problem in duplicate as "a return ticket for a single fare". The problems are arranged in order of the number of men employed, and problem 1 by W. A Shinkman, with six men, was thought at the time to be the only miniature change-mate in existence. Problem 325 has 25 men, getting on for a full complement. 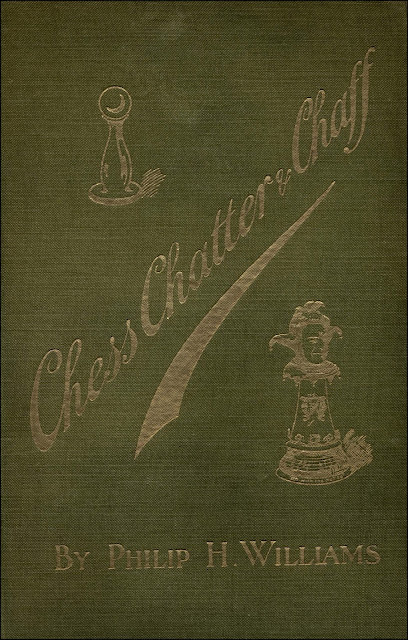 Chess Chatter & Chaff by Philip H. Williams, Stroud 1909. 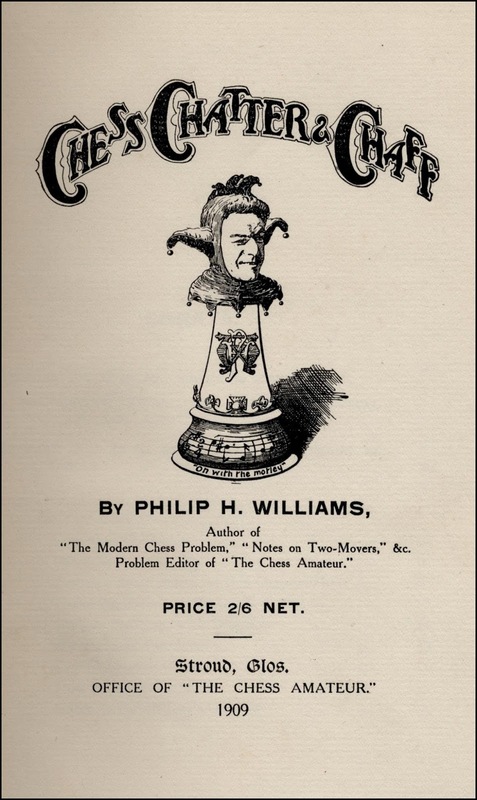 This unusual book by Philip H. Williams, the problem editor of The Chess Amateur and author of three books on chess problems, is predominantly a literary work being a collection of chess stories, articles, anecdotes, essays and poems by the author. These were written in a humorous and jocular style, and, while much of this is still amusing, some of the content now just seems silly. 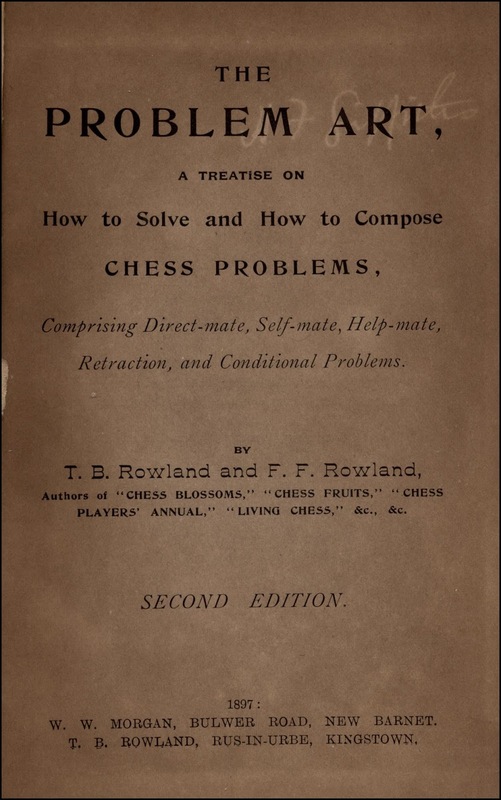 There is also some discussion of chess problems with 50 examples. Photography was another of the author's interests, and Williams took the opportunity to include several of his own photographs, including some countryside views and three shots of the interior of Ely Cathedral! 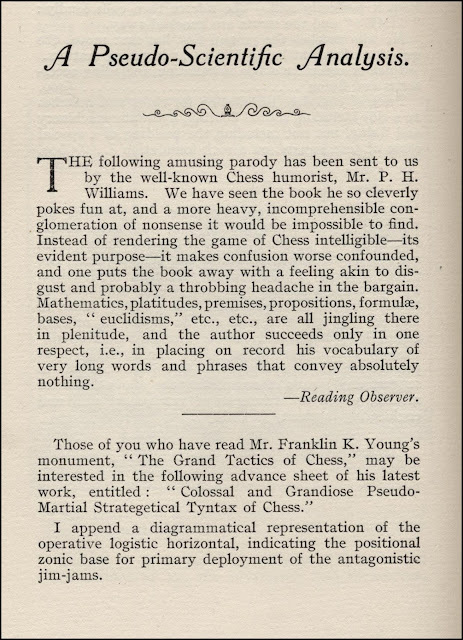 The article A Pseudo-Scientific Analysis is a clever parody of the works by Franklin K. Young. Finally, images of a few others bought last year. 2016 was a particularly fruitful year on the book collecting front and I acquired around 1,200 chess books mainly from two large collections. 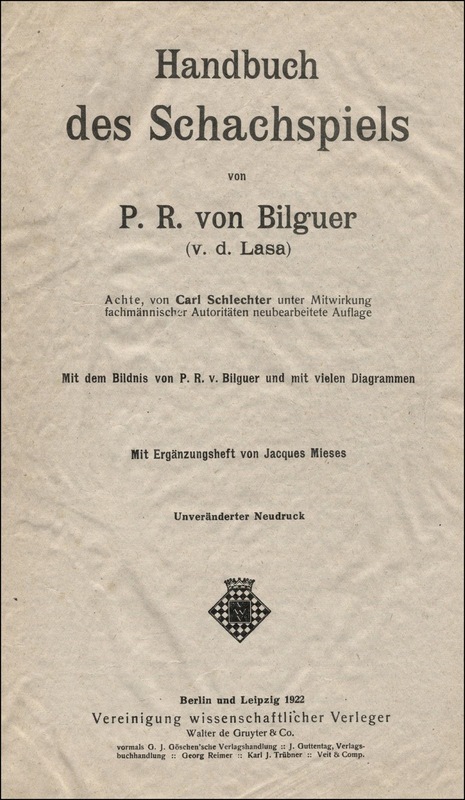 Handbuch des Schachspiels von P. R. von Bilguer (v. d. Lasa), Berlin and Leipzig 1922. 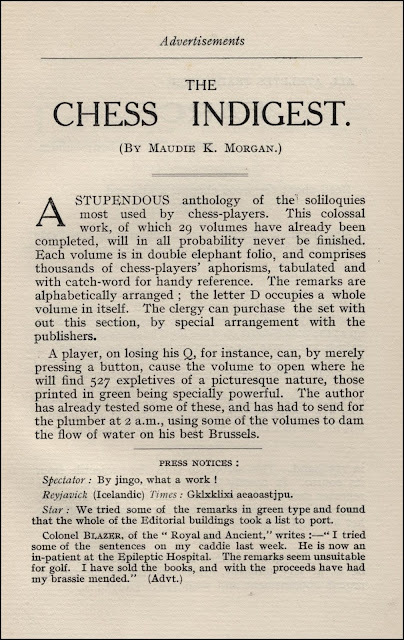 My struggle with foreign languages is the greatest handicap to my interest in chess literature and I have generally steered clear of non-English works. The main exceptions being bibliographies which I collect in most languages. 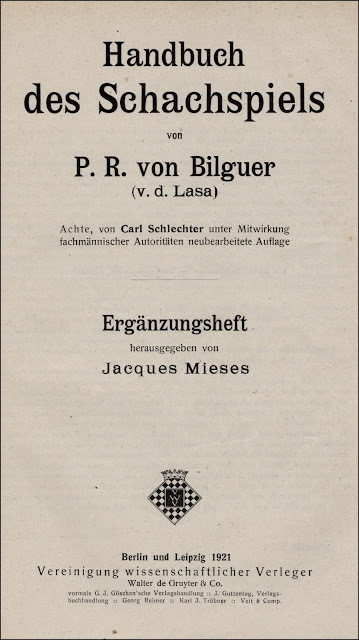 However, von Bilguer's Handbuch des Schachspiels should be a cornerstone of any serious collection and I finally succumbed last year and bought a copy of the very last edition published in 1922, nearly 80 years after the first edition of 1843. 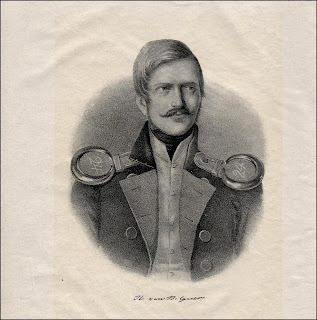 Paul Rudolf von Bilguer died in 1840, aged just 24 (five days before his 25th birthday), and the work was completed by von der Lasa. Although this book has always been ascribed to Bilguer, partly in honour of the young author's pioneering work, in reality this was von der Lasa's book. 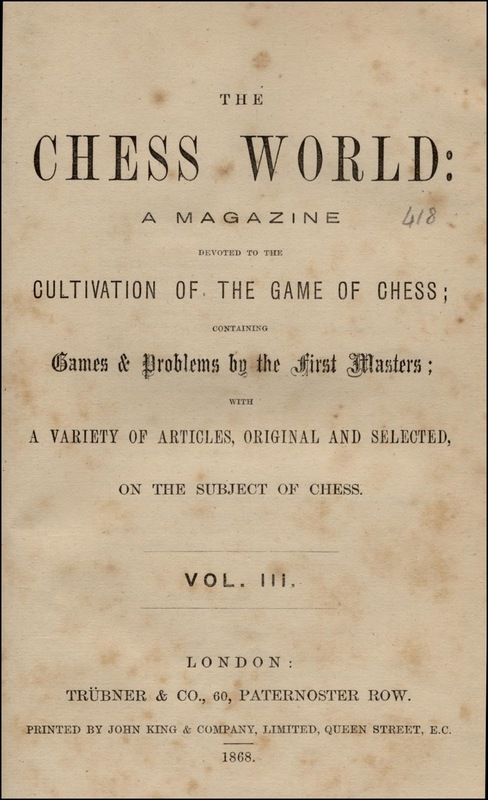 He probably contributed as much if not more than Bilguer to the first edition, he almost certainly wrote the extensive section on the history and literature of the game, and von der Lasa was the sole editor of the next four editions published in 1852. 1858, 1864 and 1874. 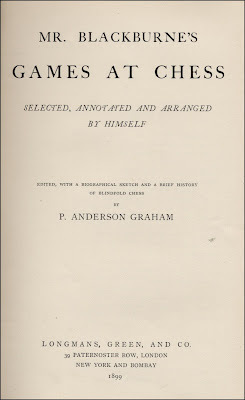 The 1922 edition was edited by Carl Schlechter, although he had died in 1918. 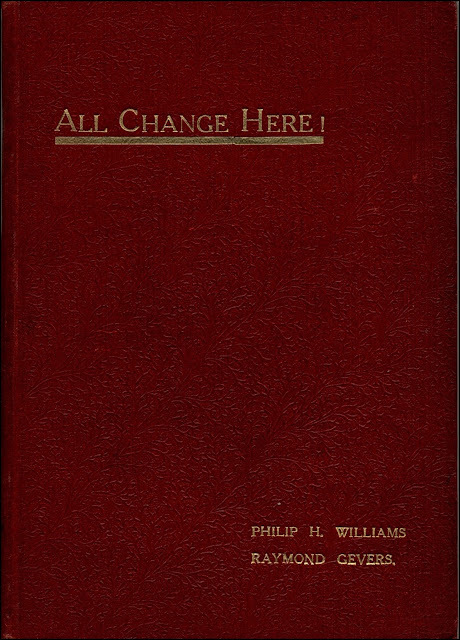 However this final edition was originally published in eleven parts between 1912 and 1916. 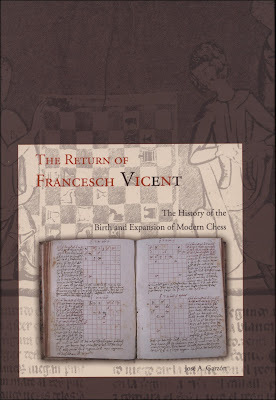 This is a mighty tome of 1,040 large pages plus a 51 page Ergänzungsheft (supplement) by Jacques Mieses. 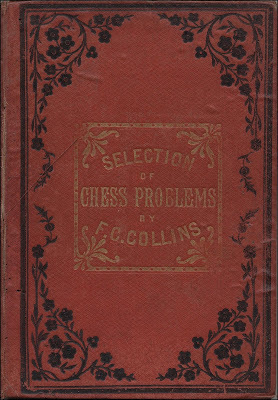 A Selection of One Hundred and Seven Chess Problems composed by F. C. Collins, London 1881. 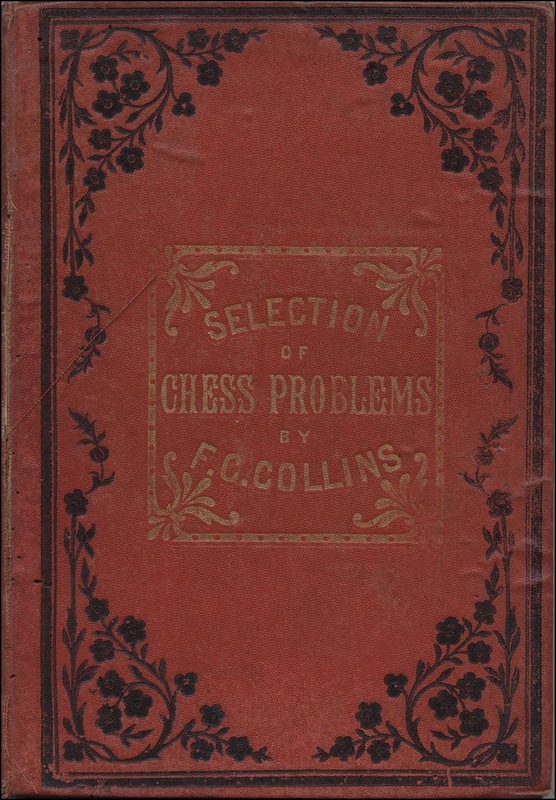 This book is inscribed by James G. Cunningham, a regular contributor to The British Chess Magazine from 1883 to 1900 as London correspondent. 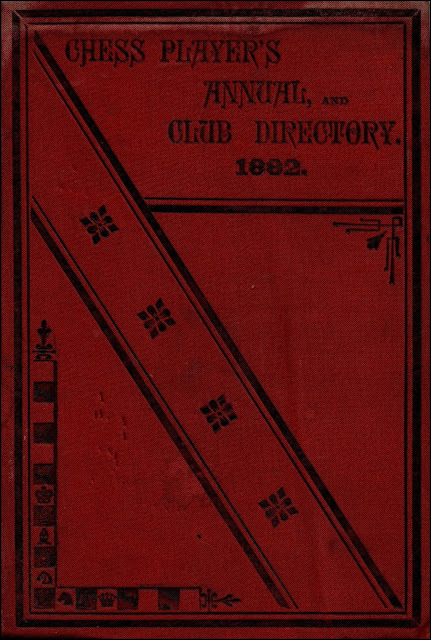 The List of Subscribers includes just 74 names indicating a very small initial edition, and this book is certainly quite scarce. The subscribers included many of the leading problemists of the era and some prominent players such as Charles Gilberg, William Steinitz and Johannes Zukertort. The Chess World: A Magazine Devoted to the Cultivation of the Game of Chess, volume III, London 1868. I now have the first three volumes and just need volume IV to complete the set. The editors of this periodical are not named but Howard Staunton is known to have been the chief editor. This was the most expensive purchase of the year. 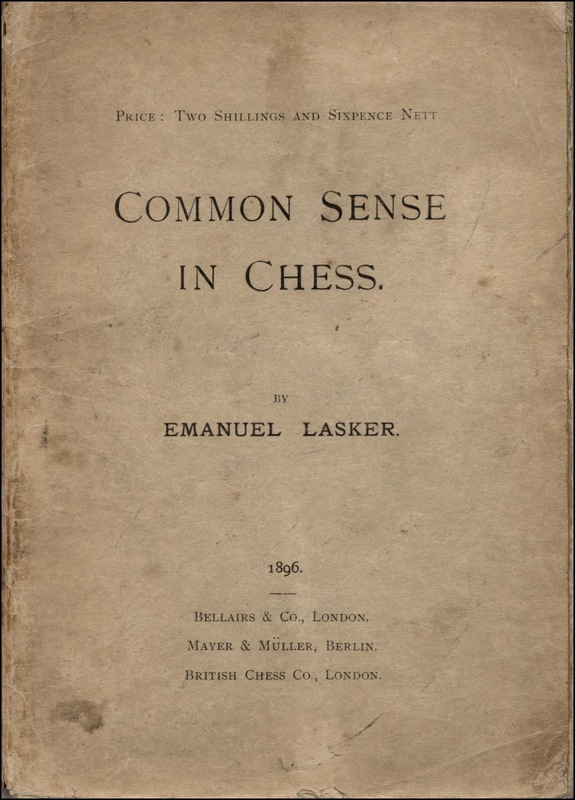 Common Sense in Chess by Emanuel Lasker, London and Berlin 1896. This is the scarce first edition of the important first chess book by Lasker. 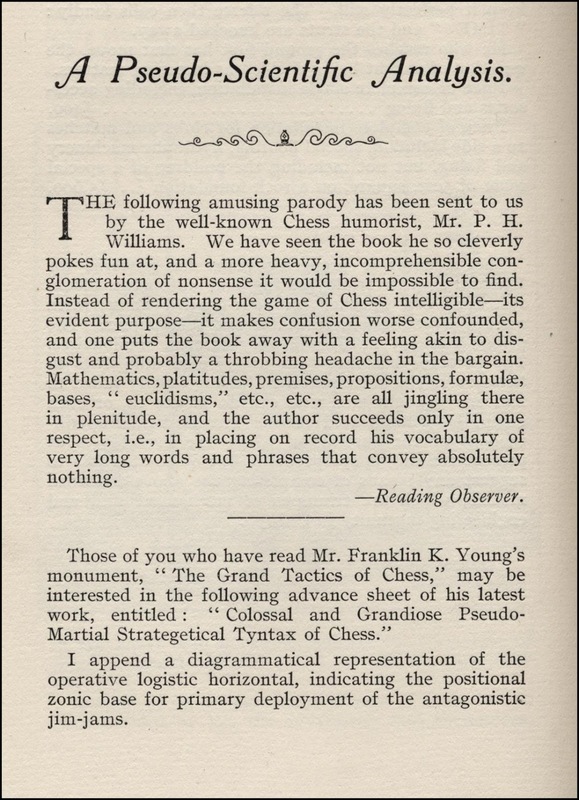 The preface is dated July 1895 so there must have been some delay in publishing. Betts 11-6 states that this book has 139 pages, but all copies that I have seen have had 141 pages. 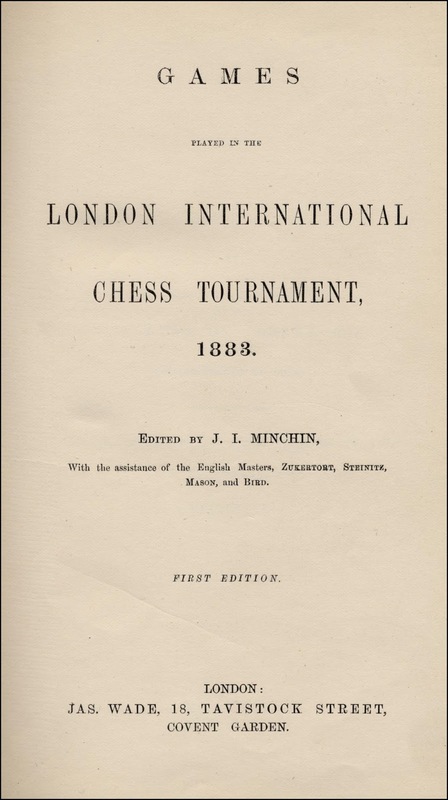 The Preface states that this book is an abstract of twelve lectures given before an audience of London chess players during the spring of 1895. 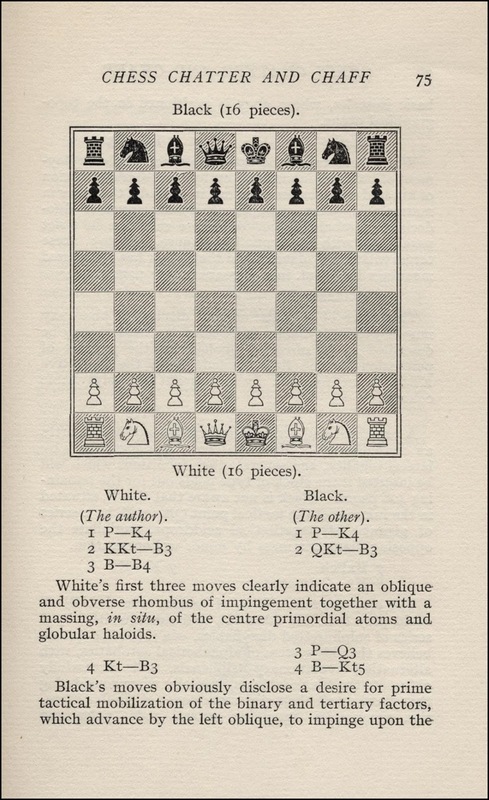 These lessons included general instructions and basic opening theory, together with annotated games by Morphy, Anderssen, Tarrasch, Steinitz, Zukertort etc., plus examples from Lasker's own play. The advice given has stood the test of time and this book has been reprinted many times up to at least 1965. 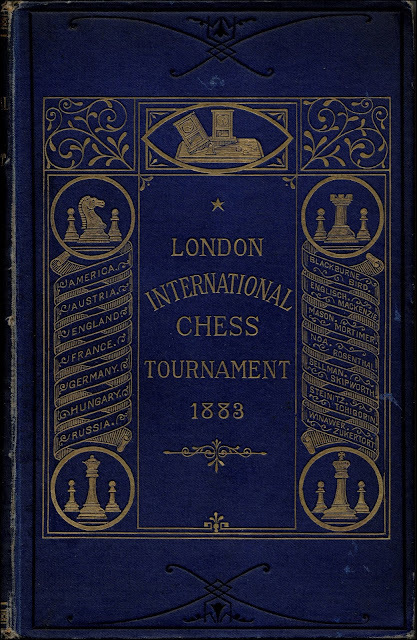 Games Played in the London International Chess Tournament 1883, edited by J. I. Minchin, London 1883. The London 1883 tournament included the World's top nine players, according to The Oxford Companion to Chess, and this beautifully produced book includes all of the games from the main tournament plus a selection from the Vizayanagaram tournament, named after the Maharaja of Vizayanagaram whose son had sent a financial contribution to the organisers. 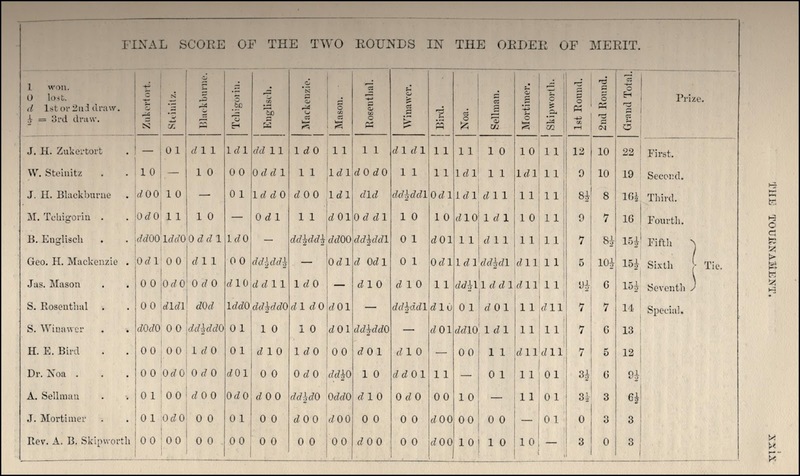 At the time, this work held the record as the fastest produced tournament book, being published just five months after the event. 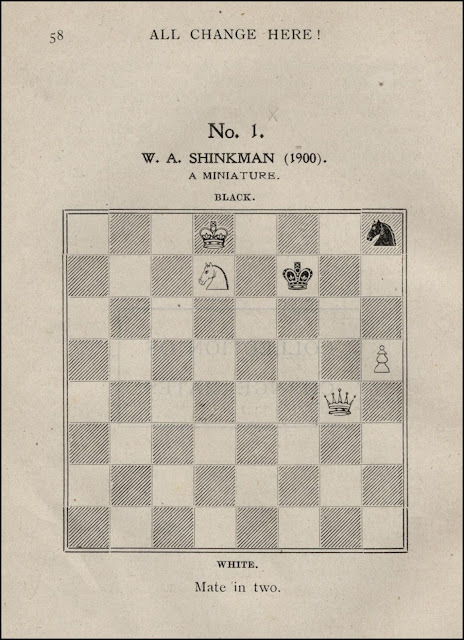 The value of this book is enhanced by the elaborate notes provided by the winner Johannes Zukertort and the runner up William Steinitz to their own games. James Mason and Henry Bird also assisted in the production of the book. 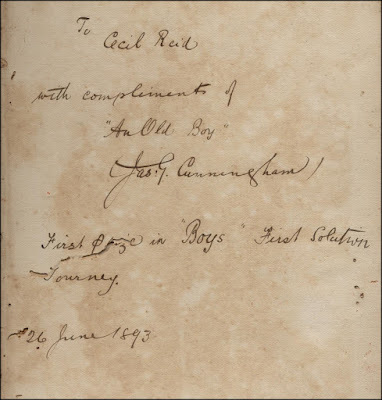 David DeLucia states in A Few Old Friends, 2nd edition, page 195, that the very attractive bindings of the first edition were printed in brown, red and blue. However, I know of one collector who has a first edition bound in green. Are there other colours?, and which is the scarcest? 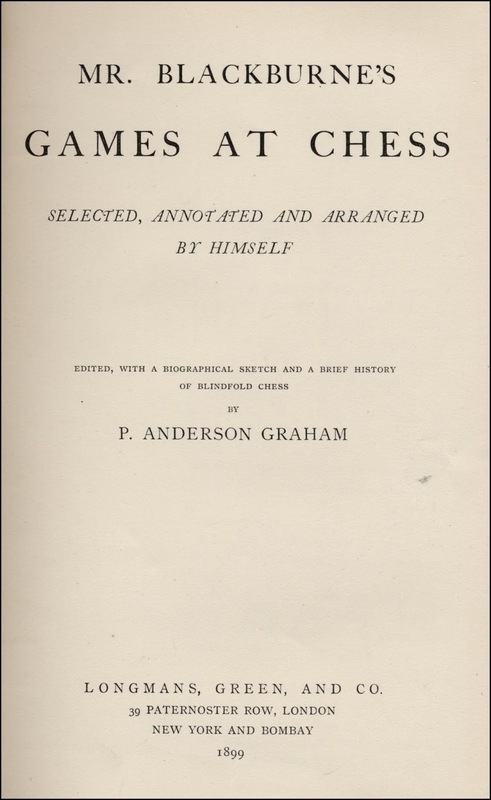 Mr. Blackburne's Games at Chess, Selected, Annotated and Arranged by himself, edited by P. Anderson Graham, London, New York and Bombay 1899. 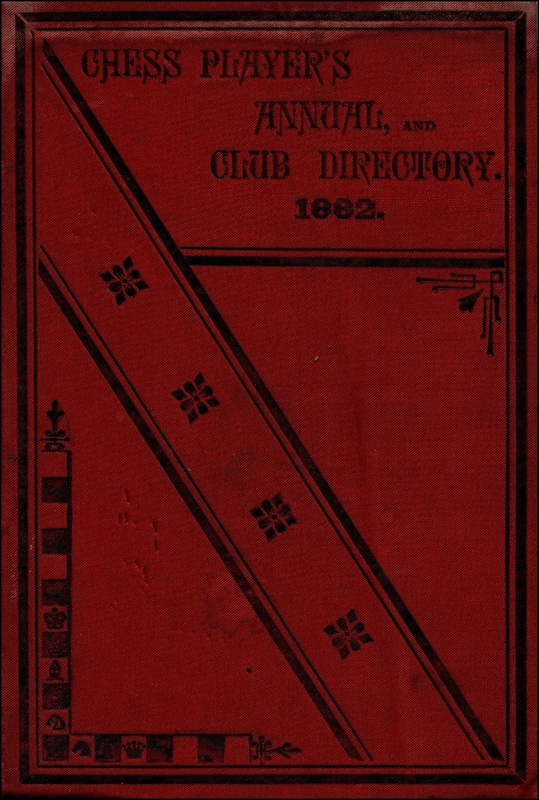 While not an uncommon book, this is a particularly fine example with all of the gatherings unopened indicating that this book has never been read. This book usually has a catalogue of works published by Messrs Longmans, Green & Co. at the end which is dated at the bottom of page 32. I have two copies with catalogues dated 9/99 and one with a catalogue dated 1/01. I will present some more of last year's acquisitions next time.